Feuz, only needing a top-12 result, finished sixth in the men's race, which was won by Dominik Paris of Italy. "It's incredible for me to have two globes now. Dominik is in a super form and I am really proud to have won it," said Feuz, who led Paris by only 20 points in the final standings. "Dominik won many races this year. 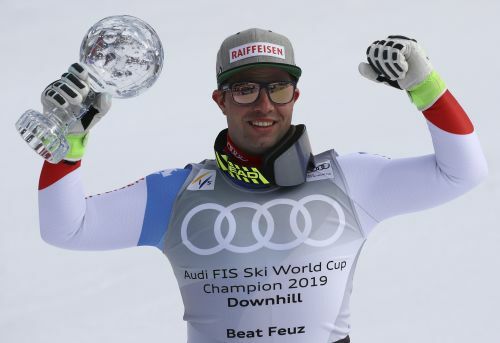 He won four, I won just one," Feuz said. "But the important thing was to be on the podium in six of the eight races this season. Consistency is my advantage." In Wednesday's race, Paris beat world champion Kjetil Jansrud of Norway by 0.34 seconds, with Otmar Striedinger of Austria 0.41 behind in third. Paris has yet to win a crystal globe, but has a chance to do so in Thursday' super-G, where he leads the standings. Leading the women's standings by 90 points, Schmidhofer only could have lost the title if Siebenhofer had won the final race. It's the first World Cup title for the Austrian women's team since Eva-Maria Brem won the giant slalom globe in 2016, and the first downhill title since Renate Goetschl won it in 2007. "It hasn't sunk in yet," Schmidhofer said. "But to be named in one sentence with Goetschl is something really special. She won in 2007 when I won the junior world title." The women's downhill was interrupted for 15 minutes after Connie Huetter crashed and landed in the safety netting. The Austrian was transported off the hill with an apparent knee injury. Huetter was out with injuries twice before this season and missed last month's world championships after tearing an ACL in her right knee in January. The men's and women's super-G races are scheduled for Thursday.